These standard operating procedures were developed to reduce the risk of spread of trans-boundary disease of aquatic animals through the movement of live food fish. 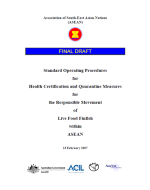 The procedures are a set of documents for health certification and quarantine measures to be used by competent authorities in trade among ASEAN member countries. The procedures recognise the existing variation in capacity between ASEAN members and have been designed so that they can be implemented across varying policy and legal frameworks. 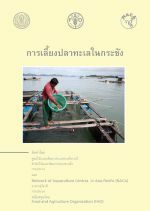 This training manual (in Thai language) provides guidance in marine finfish cage aquacutlure techniques. It is geared towards giving small-scale farmers a solid technical grounding that will enable them to improve their farm productivity and reduce losses through understanding of markets and economic factors, better farm siting. and improved feeding, handling and stock management practices. This knowledge will help the trainees and other fish farmers to improve their productivity and profitability while also reducing their risk profile. Mục tiêu của cuốn sách nhằm cung cấp những chỉ dẫn cơ bản của CBF, một hình thức nuôi cá hiệu quả, đang được quan tâm nhiều ở các vùng nông thôn miền núi châu. 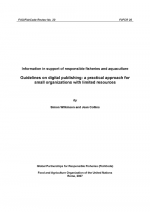 These guidelines on digital publishing are targeted primarily at small organisations with limited resources in developing countries, in order to facilitate decision-making on how to publish and disseminate their information, with emphasis on the internet. 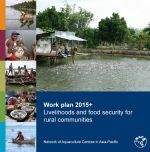 The Guidelines are based on the years of experience of the Network of Aquaculture Centres in Asia-Pacific and its partners. The approach is practical in orientation, covering topics including planning, maintenance, making content accessible and suggested tools. The National Aquaculture Development Authority of Sri Lanka (NAQDA) took several steps to regularise collectors of Penaeus monodon under the restructuring programme of the shrimp aquaculture industry in Sri Lanka. Regularisation of broodstock collectors is very imperative mitigate transmission of white spot disease. NAQDA developed these practices in consultation with the Department of Fisheries and Aquatic Resources, shrimp hatchery owners, broodstock suppliers, NARA, Wayamba environmental authority, Sri Lanka aquaculture development alliance and the consortium for shrimp aquaculture development. 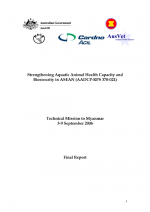 A technical mission to Myanmar was undertaken to support development and implementation of national aquatic animal health strategies from 3 - 9 September 2006. The mission was part of the AADCP-RPS project "Strengthening Aquatic Animal Health Capacity and Biosecurity in ASEAN". The mission was coordinated by NACA and worked with stakeholders to develop simple and practical approaches to implement national aquatic animal health strategies in Myanmar. This is the report of a technical mission to Vietnam from 3 - 9 December 2006, as a part of the project “Strengthening Aquatic Animal Health Capacity and Biosecurity in ASEAN” to assist national authorities in the development and implementation of simple and practical national aquatic animal health management strategies. The objective of the mission was to assist the government to support development of national strategies on aquatic animal health management and develop short and long term plans. 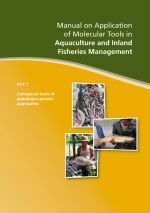 This manual provides a comprehensive practical tool for the generation and analysis of genetic data for subsequent application in aquatic resources management in relation to genetic stock identification in inland fisheries and aquaculture. 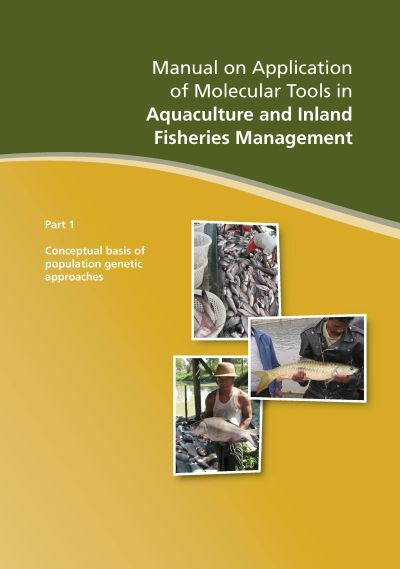 The material only covers general background on genetics in relation to aquaculture and fisheries resource management, the techniques and relevant methods of data analysis that are commonly used to address questions relating to genetic resource characterisation and population genetic analyses. 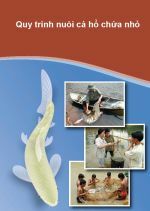 This document provides an analysis of the environmental impacts and risks associated with aquaculture development in Viet Nam and guidance on better environmental management and monitoring for its future development. Part 1 provides a summary of the main findings, and guidelines for future development of the aquaculture sector. Part 2 provides the detailed case study findings. 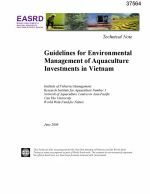 The guidelines presented in Part 1 are based on cases studies of all major aquaculture commodities in Viet Nam. 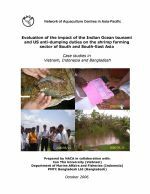 This report is the outcome of a study conducted by NACA to assess the impact of the 2004 Indian Ocean tsunami and of the introduction of US anti-dumping duties on the shrimp farming sectors of countries in the Asia-Pacific region, with special focus on the effect that these unusual events had on shrimp prices and stakeholders' livelihoods. 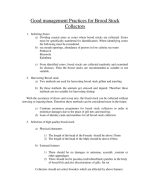 The assessment was conducted by collecting data from a wide range of stakeholders involved with shrimp farming.